"Windows 7 Wireless Network - Setup, Manage and Explore the Network Connection"
Windows 7 wireless network is one of the popular ways to setup small networks in homes and small office as you don't have to run cables everywhere. With a wireless access point connected to the Internet, any wireless-enabled computer or laptop within approximately 150 feet (46 m) of the access point indoors can connect to the Internet and communicate with other network connected computer. If the access point is also connected to a wired network, all the members of the wired network are available to the wireless computers. So, when you use a wireless connection, you may want to make sure that no other network users will directly access your computer resources. Here we will talk about what is needed to set up and use a wireless network in Windows 7 and make it secure. 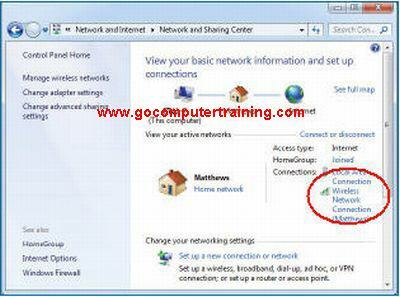 In Category view, click Network and Internet, and then click Network and Sharing Center link. From the Network and Sharing Center window displayed, if you are already connected, you will see the words "Wireless Network Connection" under View your active networks section. If you don't see a wireless connection already established, under the Change your networking settings section, click Set up a new connection or network link. From the window displayed, click on Set up a new network, and click Next. Your system will search for a wireless adapter in your computer and then for a wireless access point. When a wireless network is found, you are asked to name your network. Type a name and click Next. Type a password of at least eight characters, and click Next. Choose the file and printer sharing option you want, or keep your current settings, and click Next. Insert a USB flash drive if you wish to save your settings, and click Next. This drive can be used to transfer these settings to other computers and wireless devices. From the Network and Sharing Center window displayed, click Change adapter settings in the left hand side of the window. From the Network Connections window opens, displaying the connections available on the computer. Double-click on Wireless Network Connection to open the Wireless Network Connection Status dialog box. From the Wireless Network Connection Status dialog box displayed, click Properties button. From the Wireless Network Connection Properties dialog box displayed, click the Sharing tab, and change your connection sharing settings as necessary. When you have assured yourself that the settings are the way you want them, click OK to close the dialog box. Click Close button to close the Wireless Network Connection Status dialog box, and close the Network Connections window. Click the Internet Explorer icon on the taskbar to open Internet Explorer, and explore the Internet in the same way you would with a wired network. In case you having problem with the connection, you may need to set the IP address as describe in the configure network protocol article.